I got a copy of an older edition of Mr. Midshipman Hornblower when my stepmother cleaned out my father and her house one year and it mouldered on my shelf for several seasons before I "broke down" and read it. It was another one of those unlooked-for surprises - very readable, an exciting adventure, and Forester's knowledge of 18th century British naval life and seamanship compares to Patrick O'Brian's. It didn't sweep me away like Aubrey & Maturin's adventures did (and do) so I've never picked up another volume; though I may consider doing so just as soon as I can reduce my TBR shelf to a reasonable size. 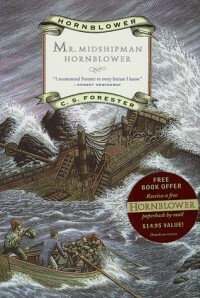 PS - My real hang up is the hero's name - "Horatio Hornblower." I just can't take seriously anyone named like that.